JohnStrege The Human Vuvuzela returns, Chris Berman anchoring ESPN’s U.S. Open coverage. Stay tuned for “David ‘Ground Control to Major’ Toms.” Alas. austincollins My god. Chris Berman calling the US Open? It’s hard to relax and enjoy golf with all that heavy breathing going on. AC830 Chris Berman anchoring #USOpen is like Larry The Cable Guy hosting the Oscars in a sleeveless tux. chad_hartley Please get Chris Berman off #USOpen coverage. While we’re at it, get Berman off TV completely. #YoureWithMeLeather. rick_avidgolfer Chris Berman’s contract clause that he announces U.S. Opens surely must give ESPN execs pause for the cause. Brutal. starnewsacc @awfulannouncing That’s because Berman is an idiot. Why do you think they keep him as far away from Augusta as possible? eamonlynch I’ll see Kelly Tilghman and raise you a Chris Berman. There is no bigger jackass — and more ill-informed idiot — in broadcasting. AlanShipnuck Chris Berman? Curtis Strange? Does ESPN hate us that much? 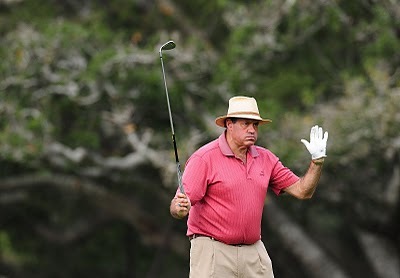 JimNeveau Memo to @ESPN: having Chris Berman anchor your golf coverage is a surefire way to get me not to watch it. bkgolfguide It’s not that I won’t watch a golf telecast with Chris Berman announcing, it’s that I can’t. Broken too many TVs that way in the past. bigpaulyb Berm must have pics of ESPN exec with barn animals to keep getting that gig. chrabe I could really use a lot less Chris Berman on this ESPN US Open broadcast. Like, none at all. michaelwalkerjr After Chris Berman makes a good U.S. Open point, he pauses like George W. Bush after correctly pronouncing a foreign leader’s name. BigEyedFisch Nothing like the bumblings of Chris Berman to ruin US Open coverage on ESPN. HoosierdaddyIU @awfulannouncing Love the U.S. Open but is there anything worse than Berman on golf coverage? EllingYelling I see Chris Berman is back doing Open coverage for ESPN. I hope all the golf doesn’t get in the way of his lame schtick. grantjess @awfulannouncing ESPN thought it was a good idea for Berman to do lead announcer at the US Open? I thought The Decision approver got fired.